Looking for the perfect mix of trucking power and Honda reliability? A certified used 2014 Honda Ridgeline is the vehicle for you. Stocked with the luxuries of comfort and modern technology found in Hondas, this midsize pickup truck is a reliable vehicle that many types of drivers will enjoy. he 2014 Honda Ridgeline comes with a five-foot bed and flip out extender, allowing you to load extensive amounts of cargo within it; a sealed bin under the bed floor adds for even more storage when necessary. Unlike other trucks in its class, a certified preowned 2014 Honda Ridgeline comes fully loaded with the technology a modern driver craves, like an in-mirror rearview camera and power accessories. 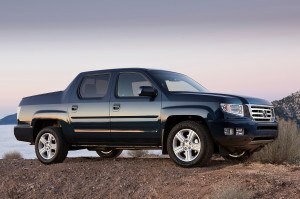 For the modern truck driver, the 2014 Honda Ridgeline is the best choice! We are actively attempting to source used 2014 Honda Ridgeline models. Please fill out the form below and we will find one for you.